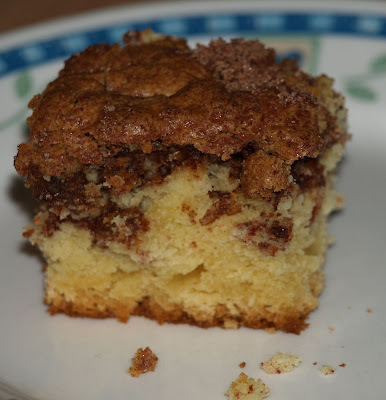 There is nothing like a nice coffeecake on a Sunday morning with a cup of coffee and the paper. I had so much sour cream left over from earlier in the week that was nearing the expiration date that I decided a nice coffeecake would be in order for us. Off I went searching for a recipe and found a great one at the King Arthur website. This coffeecake is tasty, moist and full of flavor. Cream together the butter or margarine, sugar, and eggs. In a separate bowl, mix together the flour, baking powder, baking soda and salt. Add the flour mixture to the butter mixture alternately with the sour creamt, stir well after each addition. Grease and flour a 9 x 9-inch pan. Spread half the batter in the pan, and sprinkle with half the topping mixture. Repeat with remaining batter and topping. Bake the coffeecake in a preheated 350°F oven for 25 to 30 minutes, or until the cake tests done. Place the cake right-side-up (topping up) on a plate to serve. Per Serving: 294 Calories; 12g Fat (36.1% calories from fat); 5g Protein; 43g Carbohydrate; 1g Dietary Fiber; 58mg Cholesterol; 330mg Sodium. Exchanges: 1 Grain(Starch); 1/2 Lean Meat; 2 Fat; 1 1/2 Other Carbohydrates. You can sub yogurt for the sour cream and items can be low fat if you desire.